One of our recent projects was a Tower Crane Hire at Eton College Windsor. 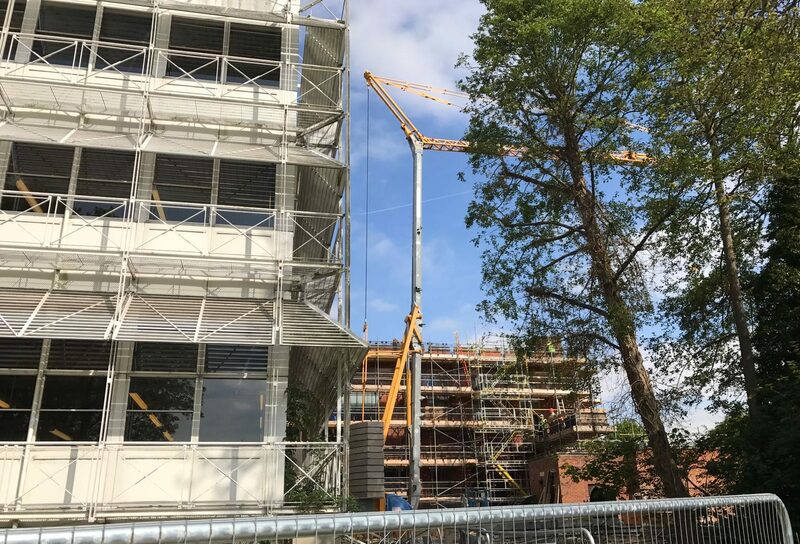 We placed the Self Erecting Tower Crane, a Potain IGO50 Pedestrian Operated Tower Crane, on site at the beginning of January for an initial hire period of ten weeks. The Tower Crane was erected on site by our Mantis Cranes Service Team and ready for operation within hours. The Potain IGO50 is a particularly popular among our fleet of cranes as it offers a 40m jib that and can lift a capacity of 1,000kg at the jib end and a maximum lift of 4,000kg to 12m. As you can see from the picture below it can be placed on construction sites where the available space is restricted due to the proximity of the structures and other objects including trees and landscape features. As the Self Erecting Crane operates from a static position there is minimal chance of machinery being damaged or scaffolding, etc. being obstructed. The Potain IGO50 will deliver its load directly to the point of work, reducing any need for additional labour and associated costs. When operating in a built-up area, close to the local population and residences, a Pedestrian Operated Tower Crane is ultra silent and there is practically no noise pollution suffered. A Self Erecting Tower Crane operates at a small fraction of the cost of a Mobile Crane.